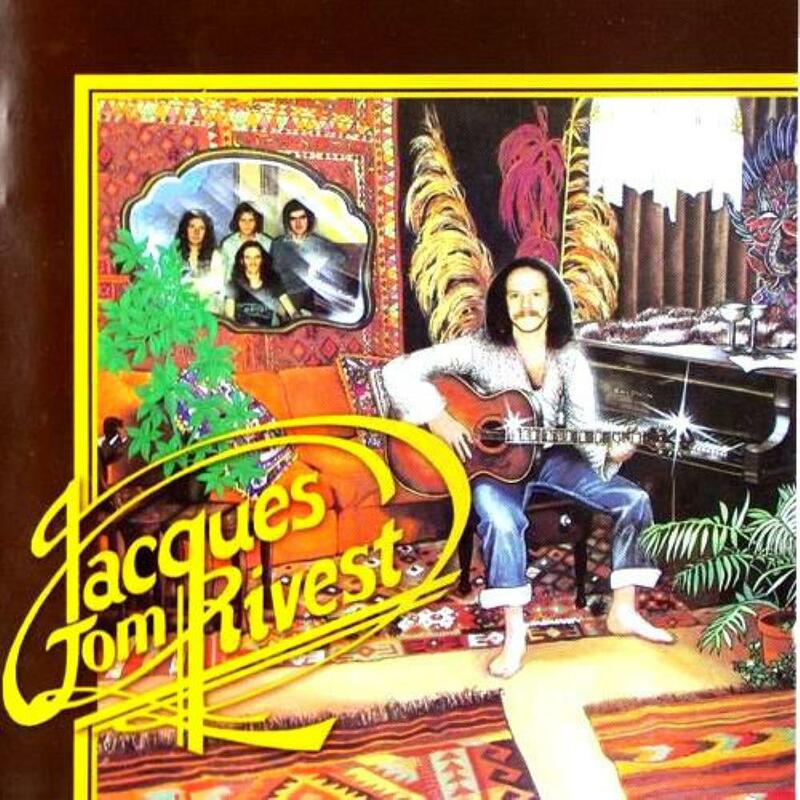 "Jacques Tom Rivest" is the eponymous debut and only album of the Canadian progressive musician of the 70's and was released in 1979. The line up on the album is Jacques Tom Rivest (vocals, piano and guitars), Richard Lemoyne (guitars and piano), Claude Lemay (keyboards), Daniel Mathieu (bass) and Serge Courchesne (drums and percussion). Jacques Tom Rivest had the distinction of being one of the founding members of one of the Quebec's most critically acclaimed progressive rock bands from the 70's, Pollen, unfortunately almost a forgotten group. Pollen was formed in 1972 by Jacques Tom Rivest and Richard Lemoyne and in the following year they were joined by Serge Courchesne, who suggested they could recruit two keyboardists, Claude "Mego" Lemay and Serge Locat to complete the group. However, it was too late for Locat as he had committed to join Harmonium, another Québecois group, one of the best French Canadian groups indeed. So, the group pursued its destiny with only four musicians, all of them with big skills. Despite their almost anonymity, Pollen was one of Québec's biggest progressive acts in the mid 70's, with Harmonium and Maneige. Their music is more purely rooted in the symphonic genre than their countrymen, whose music is more folk-oriented, Harmonium and more fusion, Maneige. The influence of major progressive acts are evident, like Gentle Giant, Yes, Emerson, Lake & Palmer, but the main influences are from Genesis. We can also see influences from French progressive groups like Ange and of many Italian groups of the time, especially early Premiata Forneria Marconi. While Pollen would only issue one album, their self titled debut album, the group carved out quite a loyal local following in a relatively short period of time. Pollen had the honour of touring the province with some of the best British progressive groups like Gentle Giant two years before releasing their debut and co-headlining with Caravan, once that album was out. But the group split-up towards the end of 1976. They were times of changing in the music industry. So, it would be passed three years, before Rivest would be heard from again when he released his self titled debut album. In reality and for some reasons, Pollen never was able to release a second studio album. But, in 1979, the story continued with the release of this solo album of Rivest, especially due to some of the songs had already been written for what would be the second Pollen's album. This album reunited Rivest with his ex-Pollen band mates, even the original drummer, Courchesne, who quit the group on the eve of the Gentle Giant tour back in 1974. So, many tracks on this album are somehow reminiscent of the group, even if they have been re-arranged by Tom Rivest, for his own use. While the music on this album has flashes of instrumental fireworks, don't expect it to sound exactly like "Pollen". The sound leans more towards folk but plenty of progressive influences remain on it. Despite its closer to the folkier side of Pollen, without forgetting about the more orchestral/symphonic side of the band, the focus here is on acoustic guitars, flute and keyboards instead of a more pronounced electric environment. Some of the material here is more mainstream. But the acoustic instrumentation, as well as the double keyboard lines and singing, reminiscent of Pollen, can be found on many of the tracks of the album. The songs are also generally more commercial as well. Rivest's soothing and tender voice guides the listener through this fine collection of material. I'd have to say that the highlight for me is the Eastern flavoured "Voyage Au Tibet" with its full and rich sound, clocking in at over 7 minutes. However there are plenty of other grand orchestral moments on this album. Tracks like "La Language De Son Pays", "Toujours Plus Haut" and "La Nuit" are also great tracks that sound very close to Pollen's original release. Over all, this is yet another solid re-issue from the progressive Québec people and one worthy of adding to your collection if you are wondering why the 70's was a magical time for this kind of music in Québec. In addition, the album is now augmented by a bonus track, the last track, "Prendre Son Temps", taken from a single released about the same time as the original album release. Conclusion: Still the self titled debut album of Rivest be not properly the second album of Pollen, it has the main ingredients of an album of the group. Rivest was the leader of the group and this first solo album finds most of Pollen helping out, only with a different bassist and the original drummer of Pollen, incidentally. The tracks are less obviously progressive, and at times are more folky or more rock. However Lemay is still in fine form on keyboards and his playing highlights four or five different tracks. Rivest was a talented composer and despite a mellow sound and short length of the tracks the arrangements are full of beautiful melodies and serene atmospheres. Many of the elements of "Pollen", wonderful melody, thick textures and interesting harmonies, are present on it. However, if you are hoping for something exactly like "Pollen", this isn't it. But, in essence, this is the second Pollen's album. Essentially, it merely reflects the time it was released, 1979, as the band tries to remain current while still having some fine progressive moments on it.